This pair of true- and false-color Moderate Resolution Imaging Spectroradiometer (MODIS) images from January 13, 2003, features the Mesopotamian Fertile Crescent in southern Iraq and Iran. The Fertile Crescent lies between the Euphrates and the Tigris Rivers. 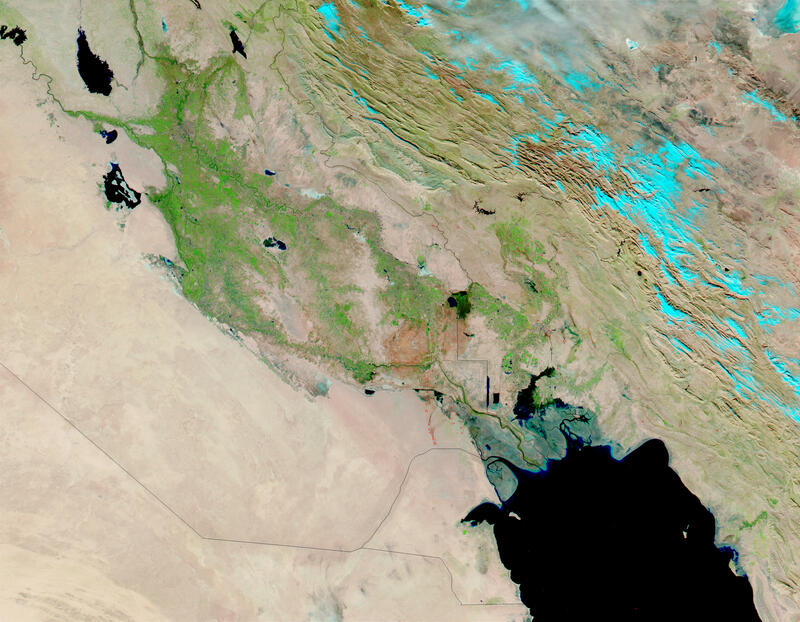 At the top of The Persian Gulf (bottom right), where Kuwait (west of the Gulf), Iraq, and Iran meet, the two rivers join before flowing into the Gulf. A number of fires were detected in this scene by MODIS and are marked in red. They are concentrated in southern Iraq and western Iran. The ones in southern Iraq are likely associated with oil wells. Snow can also be seen blanketing the Zagros Mountains of Iran at the upper center of the image. In the false-color image, burned areas are reddish brown and snow is bright blue, while vegetation is bright green.